Close one eye and squint with the other, and last night’s Game 1 box score starts to look like a positive one for the Cavaliers: The Warriors only had two players score in double figures; Klay Thompson and Draymond Green combined to shoot 6-of-28; LeBron James and Kyrie Irving did their thing. Open your eyes all the way and you see the Cavs lost by 22. How did the Warriors end up with a blowout victory despite two of its four best players essentially no-showing? By being the sort of team against which any amount of sloppy play is a death sentence. The Cavs turned the ball over 20 times and surrendered 14 offensive rebounds, which allowed Golden State to finish the game with 20 more field goal attempts than Cleveland. An embarrassing number of those field goal attempts were uncontested layups and dunks. Perhaps the Cavs could have survived those miscues against the pre-Durant Warriors, who would have had a much harder time completing the blowout with only Steph Curry hitting his shots. But Durant’s presence erases any margin of error that existed before. He scored 38 points on 26 shots while reminding everyone that the Warriors have yet another player who is capable of beating a team all by himself when given the opportunity. The Cavs presented such an opportunity, and when Thompson, Green, and to a lesser extent Curry weren’t there to seize it, in came Durant to dole out some punishment. The Cavs find themselves in the demoralizing position of knowing that they got blown out despite not even taking the Warriors’ best shot—Durant was great and Curry was good, but it felt like the Warriors made it through the game without even really running any of their deadliest offensive sets. Cleveland can’t count on Thompson and Green sitting out the rest of the series, which means they have to play essentially perfect basketball the rest of the way if they want to have a shot at winning it all. We said as much in our Finals preview, but the truth of the matter was displayed starkly last night. 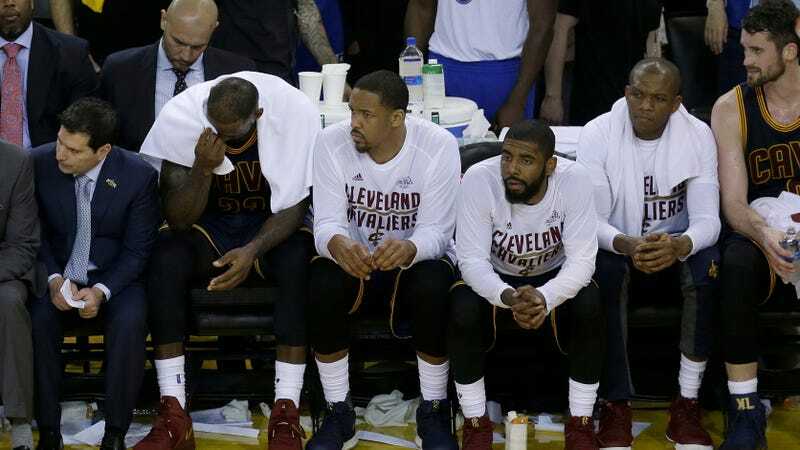 The Cavs may be doomed no matter what, but any more slip-ups will ensure their destruction.